Bats are the only flying mammal. There are nearly 1000 species (kinds) of bats in the world. They are gentle and friendly animals. They help control the insect population that can destroy crops. Bats also pollinate about 300 plants world wide. From these plants, people produce 450 products at a value of hundreds of millions of dollars each year. There are several myths about bats. A myth is an untrue fact or story. One is that bats are blind. In fact, bats see very well. They also "see" with their ears. They do this by sending out high pitch sounds that bounce off objects and return as echoes to their ears. A bat can sense an object as fine as one piece of human hair. Another myth is that bats are dangerous because they can cause rabies. Any mammal can carry or cause rabies. One bat expert said that dog attacks kill more people each year than rabies from bats in the last 15 years. Their reputation for carrying rabies is not deserved. Only one case per year in the country is linked to bats. They are to be valued for their help in controlling insects. Bats are one of the least studied and most endangered kind of animal in Pennsylvania. There are 9 different kinds of bats living in Pennsylvania during the summer. The more common ones are the little brown bat, big brown bat, small-footed myotis (means bat), and Indiana bat. Bats range in size from 3 to 6 inches. However, their wingspans can range from 8 to 10 inches. They only weigh up to 1 1/2 ounces. Their fur colors are a mix of dark brown, brown, black, gray, and red. Most bats have black or brown lips but the Indiana bat has pink lips. 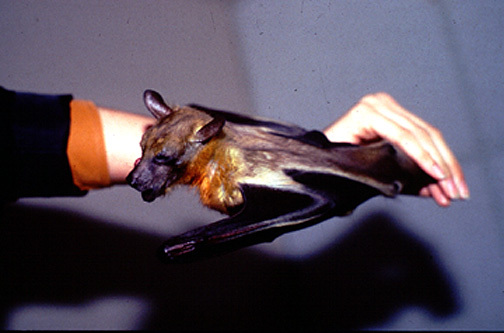 Bats have a web of skin stretched from their index finger (yes, bats have fingers) to their tails. This web of skin is attached to a wing. This allows the bat to fly. Bats live from 4 to 6 years. Mothers give birth to one or two babies in late May or early June. The young are called pups. A female rears only one "pup" per year. Bats live in groups called a colony. Their homes are called roosts. In summer, bats will live near a water supply because that is where mosquitoes breed. They can set up housekeeping in warm attics, under loose pieces of bark, and even under large bridges. In winter bats hibernate in caves and abandoned mines. Bats find the same crack in the wall 600 feet below the surface for hibernating year after year. The temperature needs to be about 50 degrees or cooler. In that way, bats do not use up much energy. Most caves and deep mines are 50 degrees or below and this is good news for bats. Recently, bats have been losing their natural habitat. Some people have bulldozed mines shut destroying thousands of bats. Without a place to set up their roosts, some bats have become endangered. Some helpful people are buying small wooden boxes called bat houses, or bat condos. They should be hung 10 or more feet high in a spot that gets more than 7 hours of sunlight (in the summer). Also, they should be hung upside down because bats enters the opening from the bottom. They will climb to the top of the box. Bats really do "hang out" or upside down. Bats eat all kinds of insects, bugs, and beetles. A bat can eat half of its weight in one night. The most common bat is called little brown bat. One little brown bat can eat up to 1,200 bugs/insects, such as mosquitoes in an hour. A colony of 100 little brown bats can eat as many as 250,000 mosquitoes in one night. A colony of big brown bats can eat 600,000 cucumber beetles in one growing season. They are considered to be carnivores, or meat eaters.